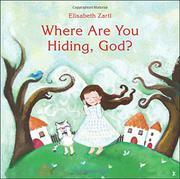 A young girl learns to find God in the smallest of things. At first the unnamed, first-person narrator cannot find God anywhere she looks: in the dresser in her room, in the bathtub, in the garden amid the flowers and dragonflies. “Why can’t I find you, God? I sit down under a tree, wishing I could see God. Then the wind blows a leaf down onto me. // There you are! I’ve found you!” And suddenly she sees God in the wind, the flowers, the dragonflies, the smallest drops of water in the bathtub. And in the mirror in her dresser, she sees God in herself (and readers can, too; there’s foil on the page): “You are here, and you are always inside me.” The narrator is a round-headed, rosy-cheeked white girl with long brown hair who wears a white-on-white patterned dress. Her eyes are perpetually closed in the illustrations, which may be perplexing to young readers, given the emphasis on looking and seeing. Her surroundings are filled with flowing and rounded forms, especially the trees, leaves, and vines, even her dresser and curtains echoing theses sinuous shapes.